Elske Rahill’s new short story collection In White Ink has been causing ripples in the literary community and beyond. 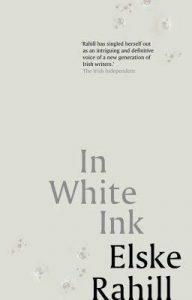 Motherhood, nurture and violence – these are the themes of Elske Rahill’s remarkable first collection, In White Ink. Rahill brings to life the psychological and physical reality of mothering, pregnancy and childbirth in ways that few others writers have attempted. Here is a biting realism, in the relations between men and women and in the expectations and failures of their assigned roles. Each story is illumined by moments of harsh poetry. They are carefully crafted snapshots of our condition. In the title story, an isolated young mother is locked in to a custody battle with her abusive husband; ‘Right to Reply’ shows three generations of women confronting the terrible legacy of their family’s past; in ‘Toby’, a woman obsessed with hygiene finally snaps, when she finds her home is infested with fleas. The precision of Rahill’s prose, the stoicism of her unflinching narrative gaze, reveal characters caught up in violently emotional situations. The version of motherhood found here is painful. Yet its endurance, as nature’s greatest force, is brilliantly and compassionately rendered.